The Mole Tunnel Pilot was specifically designed and developed for use with the Steve Albano "Trapline Mole Trap". For size referencing one of the Standard size trapline mole traps are shown above with the Mole Tunnel Pilot tool. The tool is constructed of heavy duty solid aluminum stock material that is very durable and rustproof. Its sturdy welded construction will hold up to very vigorous use and most likely last a lifetime of general use. I have used this tool for 10 plus years with little wear to the tool other than superficial abrasion scratches. The first first prototype tool I constructed was made of wooden components with metal components holding the tool together. I used the initial wood fabricated tool for many years with great success. Eventually finding that solid aluminum construction served the best purpose for the tools final production design. The prototype Mole Tunnel Pilot was originally developed for use with the "Standard Size" trapline mole traps. However upon further testing it was found that with a bit more rocking motion of the Tool while in the mole tunnel, the "Large Model" style trapline traps can be used with the "Mole Tunnel Pilot" as well. The Large Model trapline trap has about a 1/4" wider jaw width then that of the "Standard Size" trapline mole trap. These wider jawed traps are commonly used for the larger specie of mole and consequently a larger tunnel size. Those not familiar with the trapline mole traps will find that they are very light weight, durable and constructed of premium quality stainless steel. 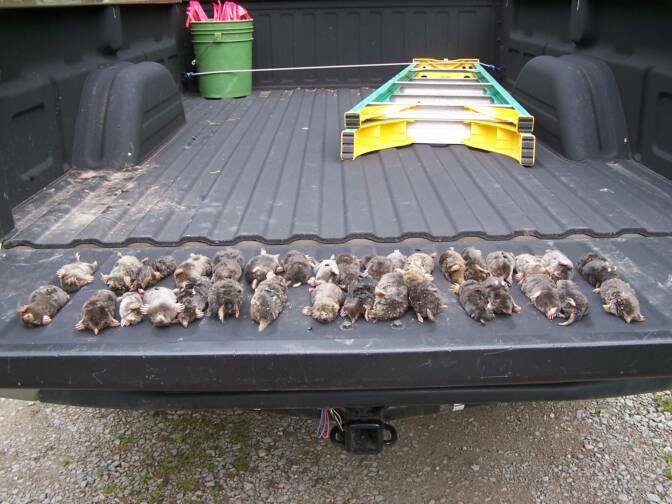 They are extremely effective traps for mole control trapping and are being used world wide by Wildlife Control Professionals. 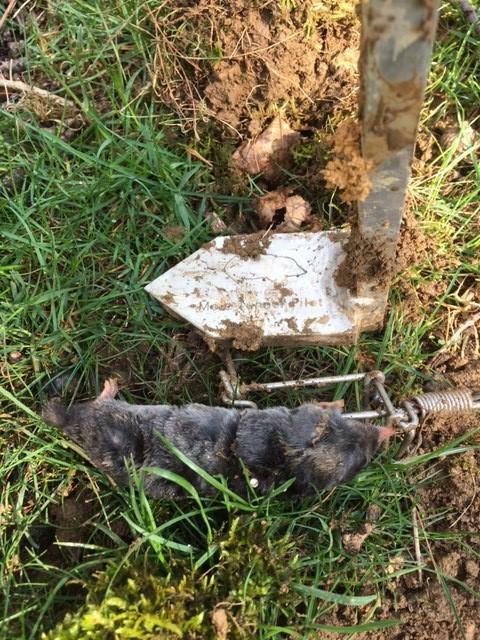 We have also used them for vole, shrew and other smaller rodent species control.Our company, students, employees and a few close associates have been using the trapline traps exclusively with the Mole Tunnel Pilot for many years with great success. I have used most of the commonly available mole traps over my lifetime successfully. 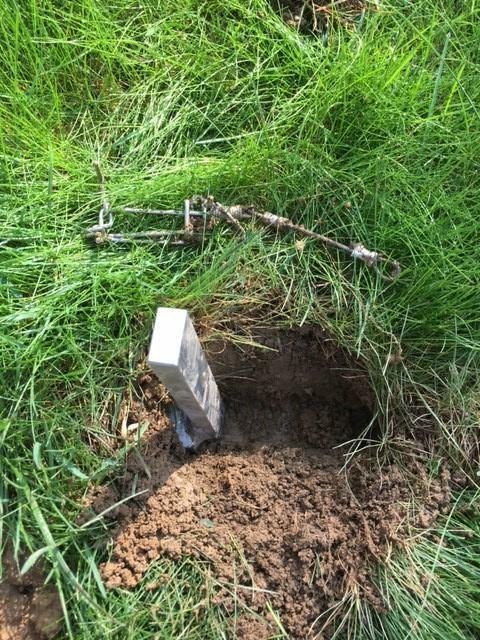 There is a learning curve associated with every type of mole trap that is available. I have learned to use them all over the years. 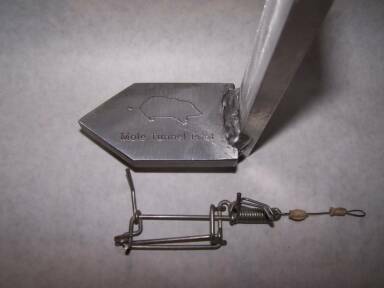 In my early years the spear mole trap and the Out of Site were the staple mole traps being used in the U.S. for the most part. There are several others I have used and tested to which I had success with them all once I worked with them for a while. When the Albano trapline mole traps first became available I once again had to work with these new traps to establish an effective, consistent method of set up and best use mechanics. Over a period of time I did just that. 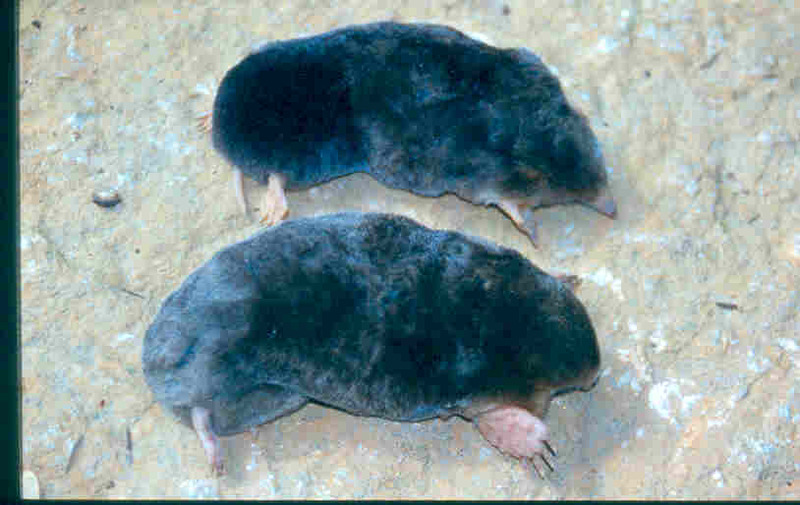 We have a good mole population in our part of the country and the population is on the rise it seems. So having a good mole population was a big help in shortening my learning curve. The real bonus in helping my system develop and helped with the concept of my tool to evolve is that I have an endless population of moles on my home property acerage.I could work as long and as hard as I wanted to put together a very progressive mole trapping system using these new little traps. During this trial and error process the need for a way to speed up my setting time, reduce misses caused by roots, rocks and other types of ground debris essentially helped me in the design concept of the tool. It became clear that the MTP saved me time and increased my efficiency significantly. I was on to something so it seemed. I hesitated to share my invention for many years until the last few years as things "usually go" the word got out. I never planned on marketing the tool but interest in the tool forced the decision to be made for me. The MTP not only gave me the ability to set the trapline traps in the conventional manner with the jaws facing up but now with the function and design of the Mole Tunnel Pilot I was now able to set the traps very effectively upside down.Thus allowing me to easily catch those occasional dig under moles that occur every now and then. In fact, I find myself setting the traps upside down more often now then I do setting them in the "so called" conventional manner with the jaws pointing up. Learning to read and indentify the primary mole tunnel routes and their sometimes complex tunneling maze poses a challenge for the beginner or someone still learning his way through understanding mole behavior. Selecting active runs and the best travel routes of the mole is probably the most important and at times difficult part of this type of work. In order to do a good clean out or population reduction particularly in my area, you "have" to set a lot of traps to cover an area properly to intercept as many individual moles living or moving through the tunnel network. Trap setting mechanices is usually the easiest part to teach someone. Then practicing the trap setting mechanics over and over gives them the skill set muscle memory and confidence needed to do it on purpose time and again there after. Intersecting the best well used runs, opening up those fresh mounds still being excavated and identifing those new tunnel runs just beginning to advance are some key locations to set for an effective job being done in the shortest period of time. The rest is trap maintenance and giving the moles adequate time to travel between your check schedule days. The "Mole Tunnel Pilots" primary function is to enlarge / configure and ultimately prepare the mole tunnel to accept the trapline mole trap. It does this regardless as to the tunnel size, roots, small stones and other buried ground debris. It also helps you to identify potential solid obstructions that may not be otherwise visually detectable.These missed can cause problems when setting the trap. The MTP helps to prevent alot of trial and error, misses, miss fires and waisted time as a result of poorly set traps in general. These situations typically may not be detected until your first trap check.The result is missed catches which causes an income loss. I make my initial sod cut into the selected mole tunnel trap set site which should be as closely centered over the mole tunnel as best you can determine. An initial 7" Length ( left to right cut) X 5" Width ( top to bottom as viewed ) will allow adequate room to work the tool and to set your traps. Two traps are usually set per location. One trap is inserted into each opened run on opposing sides of the sod cut out. On occasion you may only have one trap to set if it is on a "dead end" still developing tunnel extension. Once the traps are inserted into the Mole Tunnel Pilot channel and bedded I run a flag marking wire through the tether loops to mark and fasten the traps together. I use a dandelion tool for probing the suspected tunnel area to find the mole runs and also to help me to determine the direction of each tunnel prior to trap set placement. It is important that you set your traps in proper alignment in the run to prevent blocking of the tunnel with one of your trap jaws. Doing this improperly will surely cause a dig under or dig around avoidance reaction by the mole. You will know when this happens. A novice can be taught good trap setting mechanics of the trapline traps in a very short period of time with the use of this tool. I hear and read where many are having a difficult time using the trapline traps due to one reason or another. The MTP can help resolve many if not all of those challenges very simply. It has been a game changer for me over the years. I would have liked to have had a tool like this many years ago when I first started using these traps. One of two challenges encountered when mole trapping with the trapline traps is that a moles tunnel is most always smaller in diameter then the jaw spread of the trapine trap. The second challenge often times is the soil in the tunnel set up area may be very hard with clay content or other hard ground conditions making setting the traps very difficult or near impossible. A local wildlife control company owner who is also a close friend carries a small hammer with him in his tool bucket to tap the base of his tool into the tunnels due to having bad shoulders. He can't insert the tool as you would typically due to his discomfort and slight handicap. It is too painful for him to do the rocking and simultaneous pushing motion needed to insert the MTP tool easily into a run. I have found through experience that for the trapline trap to perform at its best consistent tunnel prep/enlargment is needed to alow acceptance of the trap without restriction enabling the trap to function properly and at full spring power. A trap that is set in a very tight restricted space is more prone to malfunction then one that is fitted just right each time it is set. Such space restrictions of the trap can result in the failure of the trap spring to fully rotate or you may have jaw closure restrictions from tunnel obstructions. 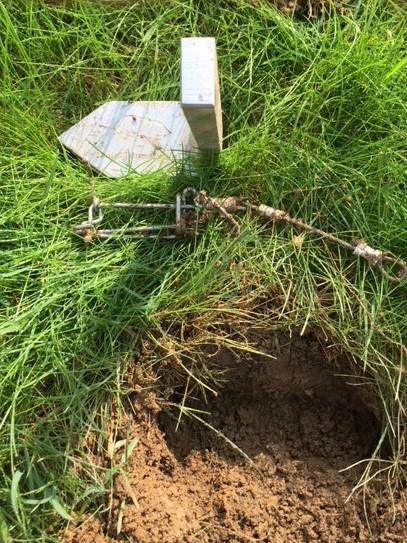 Many do not understand or consider the effect of gravity on the weight of the dirt that you compress in your trap setting method in order to set your trap in a run. Or the impact of rainfall on the settling/compression effects it has on your traps over a few days. All these conditions are in motion constantly affecting how some of your traps will function. The MTP tool compresses the dirt in the trap placement area helping to reduce the dirt settling/collapse effects that can cause trap malfunction problems. The trapline trap spring needs to be unobstructed in order to rotate freely to make a good clean catch and a resulting quick dispatch. Never stake a trap through the end ring on the trap. Doing this will restrict the rotation of the trap spring causing the trap to malfunction by restricting the jaws from closing properly. Using your fingers to enlarge the tunnel for the trap is probably a common practice for many. I had done the same method in the early years for lack of a better method. However that method I found had its limitations and came with some issues. Fingers do not extend far enough into the tunnel to ensure the trap will fire unobstructed all the time. Traps hang up frequently from grabbing roots or other debris that may go undetected using the finger tunnel prep system.Thus resulting in a miss more often then you would like at times. Some of these details may sound a bit complicated but it really isnt. It is just some things that need to be dealt with and understood in using these traps effectively or any other trap for that matter. Each mole trap has different ways to be set so it functions properly and effectively. Most of the seasoned professionals have their preferred method of trap setting and trap preferences.Unless we were mentored or instructed by another showing their method of setting and their trap preference that may help you learn much faster. I can carry 20 dozen of trapline traps in a couple buckets with very little weight or bulk in terms of space needed for them in a vehicle. O/S or spear traps are bulky and heavy in comparison and you can only catch one mole per trap site. We catch many doubles per location on our jobs. Of course we have a good mole population that contributes to that success rate. But it does allow for faster results once you master your equipment use and learn speed setting techniques. I have found a system that works best for me by eliminating the most common problems that I have encountered over the years in using the trapline traps. Until a better or newer concept device is developed I will continue my current system of operation.The Mole Tunnel Pilot has enabled me to eliminate all of my earlier challenges in using the trapline traps. The tool has greatly decreased my setting time, eliminated trap malfunction and hang ups due to tunnel debris, increased my catch rate by significantly reducing misses due to trap avoidance all at the same time. Pushing the front end of the trap jaws and frame base down into the bottom of mole tunnel is a key element in avoiding dig unders. Doing our job a bit faster and more effectively is an assest to us all over the long haul. I am confident that MTP will help you in the field with your mole control work as it has for me over the years. It sure will make your job much easier and productive. Positive shortcuts are always a benefit in your business as long as efficiency isn't sacrificed. I hope you all are enjoying each day in the field as I have over my lifetime. The challenges are many at times for those that do what we do for a profession. However, the sense of accomplishment and a job well done that comes from resolving a problem or challenge comes with great rewards to us all. If you have questions that may not have been answered I will do my best to assist in answering them as time permits. Phone calls work better for me as I don't do a lot of typing replies as my time is limited. 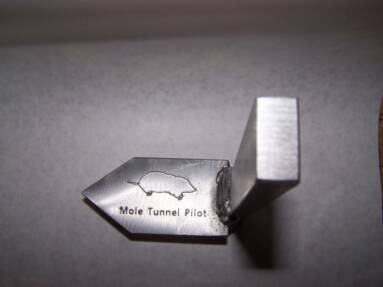 All Mole Tunnel Pilot tools will be sold on a first come basis. There has been strong interest in this item so there may be a back order situation at times until our inventory is re established.